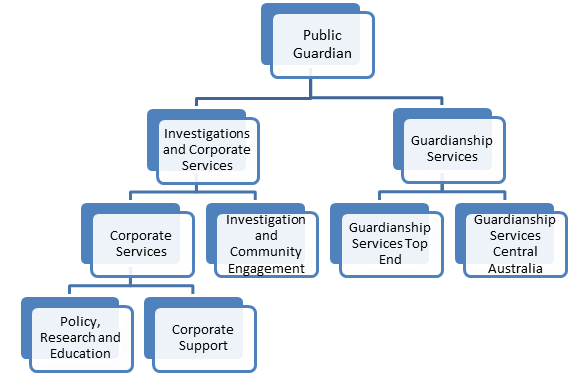 The Office of the Public Guardian was established on 28 July 2016 under the Guardianship of Adults Act 2016. Our mission is to provide adult guardianship services, information and advocacy that is responsive to the needs of the Northern Territory community and reflects contemporary, best practice guardianship principles within a human rights framework. Beth Walker, as Public Guardian, heads the Office of the Public Guardian. Our staff are dedicated to helping people who want to know more about guardianship. Our dedicated staff provide telephone and face-to-face guardianship information and support to people in the Northern Territory. The Office of the Public Guardian acknowledges the Aboriginal peoples with whom we work and for whom we provide a service. We pay our respect to the Ancestors, Elders and Aboriginal communities who are the custodians of this land. The Guardianship of Adults Act 2016 provides the legal framework for adult guardianship in the Northern Territory. The Act commenced on 28 July 2016 and established the independent Office of the Public Guardian and the statutory position of Public Guardian.